Highlighting advances that have lent to the topic's distinct, coherent methodology over the past decade, Log-Linear Modeling: Concepts, Interpretation, and Application provides an essential, introductory treatment of the subject, featuring many new and advanced log-linear methods, models, and applications. 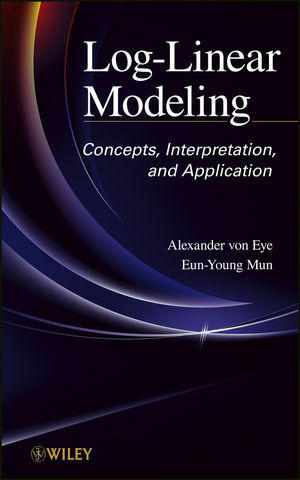 Throughout the book, real-world data illustrate the application of models and understanding of the related results. In addition, each chapter utilizes R, SYSTAT®, and §¤EM software, providing readers with an understanding of these programs in the context of hierarchical log-linear modeling. Log-Linear Modeling is an excellent book for courses on categorical data analysis at the upper-undergraduate and graduate levels. It also serves as an excellent reference for applied researchers in virtually any area of study, from medicine and statistics to the social sciences, who analyze empirical data in their everyday work. ALEXANDER von EYE, PhD, is Professor of Psychology at Michigan State University. He has published twenty books and over 350 journal articles on statistical methods, categorical data analysis, and human development. Dr. von Eye serves as Section Editor on Categorical Data Analysis for Wiley's Encyclopedia of Statistics in Behavioral Science. EUN-YOUNG MUN, PhD, is Associate Professor of Psychology at Rutgers University. Her research focuses on extending generalized latent variable modeling to the study of clustered, repeated measures longitudinal data.